For my daughter’s Harry Potter party, I wanted to give each kid something that seemed really magical, not just cheesy party favors. Something they could use at the party and something that would remind them later of how much fun they had. But it also needed to be something inexpensive. So, I made realistic looking Harry Potter wands. We searched all of the trees and plants in our yard for wand-sized sticks. Not to skinny or too thick and about 10 – 12 inches long with the right feel for casting an alohamora spell. 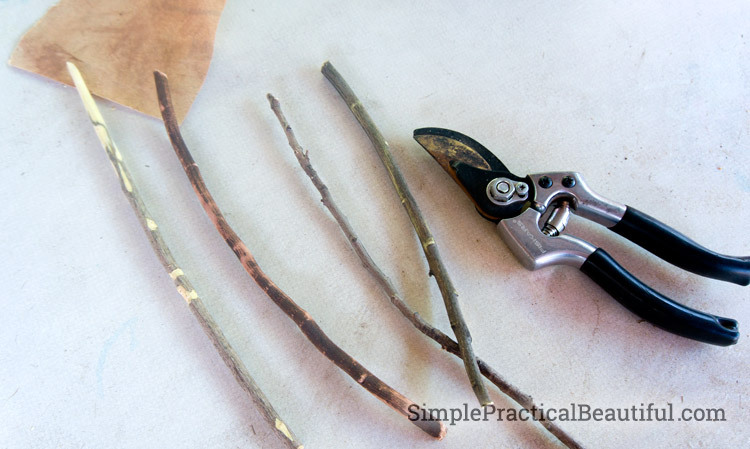 We clipped about 20 sticks and cut any branches off, then let them dry for a few days. 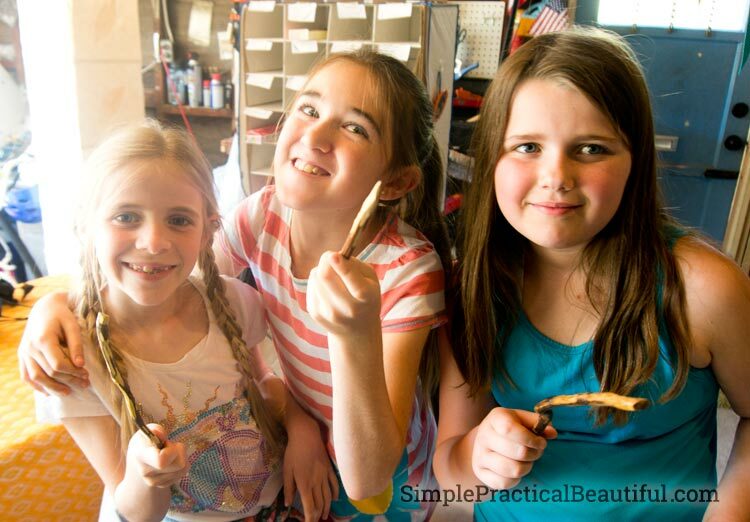 We chose the 10 best sticks, and I started whittling. I used a little pockets knife and scraped off any nubs or rough spots. I scraped the bark off some of the stick. 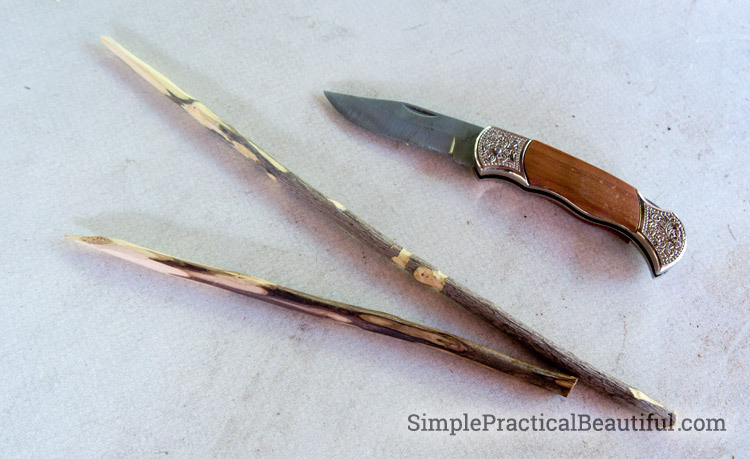 I whittled a small point on most of the wands because I thought that made them look more finished. When I say “whittling” I hope it doesn’t sound like I am skilled at some long-lost art. I did not carve animals with intricate details out of the wood, I just scratched at sticks with a knife. Some turned out better than others. 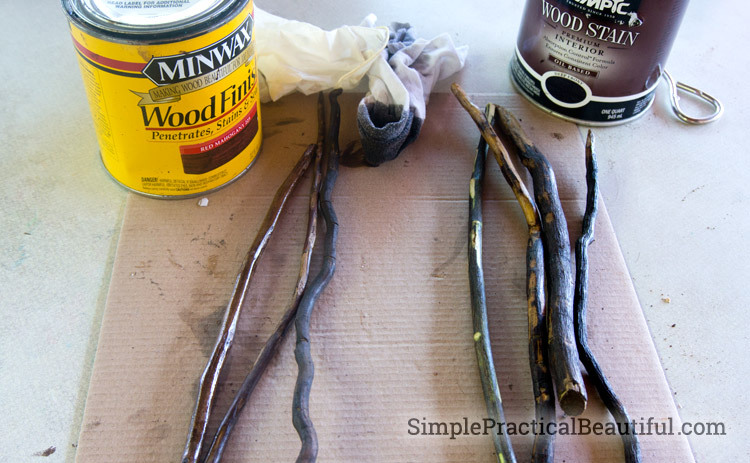 The wands in the Harry Potter books are all made from different types of wood, so I gathered every stain and finish I could find. Some wands we stained ebony, some mahogany, some walnut. Others we left natural. We tried different finishes, but Minwax Polyurethane in gloss looked the best. Using a gloss finish made it look like more than just a stick, so they all got 2 coats of polyurethane. 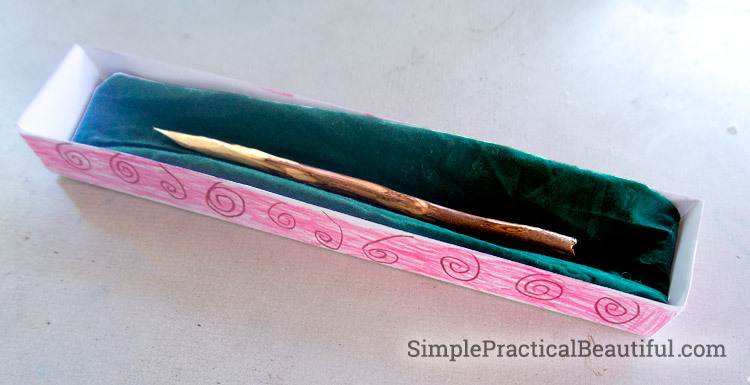 In the Harry Potter movies, Olivander keeps all of his wands in their boxes, so we had to make boxes for our wands. We cut and folded them out of large sheets of paper. The boxes were 2 inches by 12 inches, to fit all of the wands sizes, and 1 inch tall. I started with a 16X6 inch rectangle. You can use cardstock, but just I used regular paper. Fold each side in 1 inch, and then again another inch. This will make the side 2 layers thick so they stand up better. 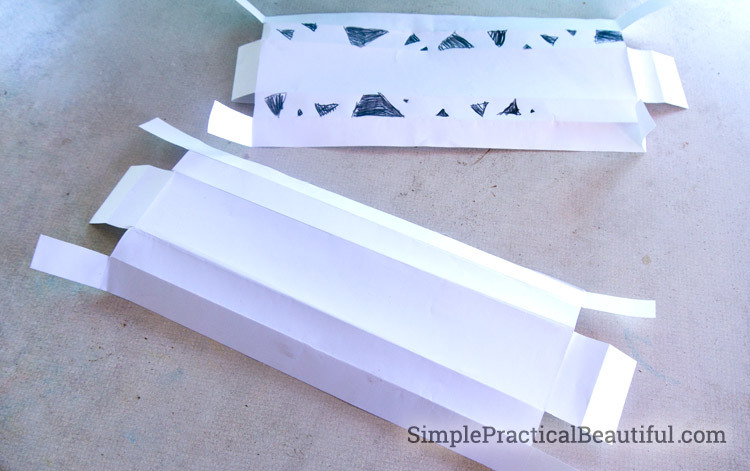 Unfold all of the sides and cut out the corners, but leave a little bit for the tabs. My daughter colored the sides of all of the boxes before we folded them up and taped them on the inside. She colored each box a little differently. Then, we added a small piece of fabric to each box to make it look more like a jewelry box. All of the kids at the party had fun choosing their wand and casting spells. Read the post A Harry Potter Party Experience to see how they chose their wands (or rather how the wands chose them). Also, the post A Harry Potter Party at Hogwarts tells class activities for the party and has a printable spell book filled with spells and other magical activities. Or learn how to make a sorting hat. I think the packaging helped a lot too. The kids at the party loved getting their own wand in a box. It made the wand feel like more than just a stick. Thanks for stopping by! Have I been to your Harry Potter site before? I remember being impressed then, and I am impressed now. I’ve read all the books and seen all the movies. What happened to the actor who played Ron, I wonder. Thanks, and thanks for stopping by. I enjoyed all the books and movies too, but not quite as much as my daughter, I think.